Well, at the rate I've been going lately, just publishing a new blog post should qualify as a Monday Made-It (or Tuesday Made-It ... it's summer - we're not supposed to keep track of days, right?). My last post was one month ago, and I titled it "Riding The Crazy Train". I don't believe I've gotten off that crazy train. But at least it's been a bit less stressful. A bit. And hotter. Much hotter. My girls and I have been enjoying every minute of summer so far - lots of outside fun, summer camps, soccer, and now some inside crafting ... because it's WAY too hot outside. So, here it is ... my Monday (Tuesday) Made-It. 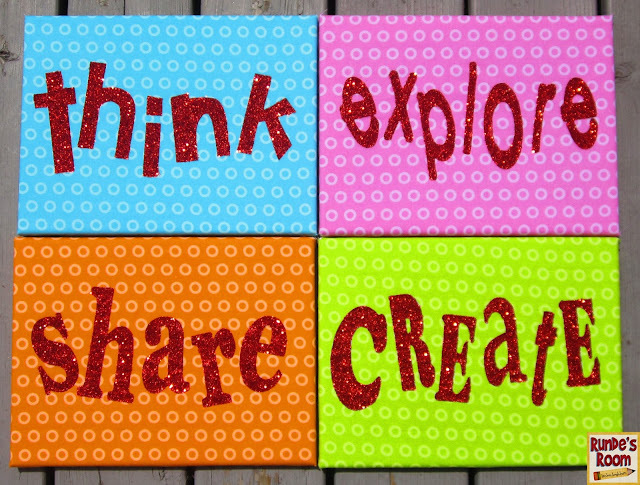 Four canvas boards, covered in fabric, with four sparkly inspirational words for my classroom. I can't wait to bring these to school (and my husband probably can't wait, either, because right now they're currently occupying our dining room table). 1. First, I measured the fabric (I used quilting fat squares) so that it would fit around the canvas (8 x 10). I cut a notch out of each corner so I could fold it around the canvas at little more easily. 2. I used a glue gun to attach the fabric to the back. This pic is my oldest daughter making hers - we did some crafting together while my two youngest daughters were at dance camp. 3. For the lettering, I printed the words out on the computer, cut them out, then glued them to the board. 4. I "painted" each letter with mod podge, then added some sparkle. I chose deep red because I have a deep red wall in my classroom, and I'm always looking for ways to tie that colour in so it doesn't look out of place. I did two coats of the mod podge and glitter so there weren't any spots showing through. I then went over the glitter with one more coat of mod podge to seal it all in. 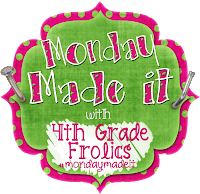 I'm linking up to Tara's fabulous Monday Made-It over at 4th Grade Frolics. If you're looking for a little inspiration, I am POSITIVE you will find some there! Those will certainly brighten up any classroom! Lovely! Awesome! I love how simple, yet inspiring they are. Your signs turned out fantastic! Love the sparkle and red! They came out beautiful!!!! Very inspirational!! The signs look great, very inspiring. I think getting a blog post done in the summer should count for something! It is hard to write about teaching when you aren't teaching. 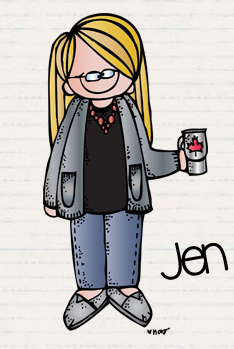 Hi Jen!!! I found your blog on Pinterest and I'm glad I did because I'm so making these cute little signs for my classroom! Thanks for sharing!!! I'm a middle school (almost) teacher, so head on over and check out my blog. There is a giveaway going on right now! Love these signs! I would have never thought of doing these this way. Thanks for the idea! Glad to see your post again...missed you! So cute!! Now I think I have another project to do!!! I am so in love with your blog and your teacher's pay teachers store. I just bought the Interactive Math Journal. I am back in 5th grade this year after trying out (and realizing I do not belong...) middle school for 2 years. I have so many ideas and so much I want to do....where to start....how to do it all. Thanks for all the great ideas.